A 3000 watt 12 volt dc to 120 volt ac power inverter allows you to take a 12 volt battery power bank and invert its direct current into 120 volt alternating current and power your standard house hold electronics. The Royal Power 3000 Watt PI-3000 can provide up to 24.25 amps of ac power. With this much output current you can run all types of micro wave ovens, a large range of air conditioners and power tools. This unit includes digital monitoring that allows you to monitor battery voltage and wattage load applied. The unit also has a mounting bracket which is ideal installing this unit in your service vehicle. 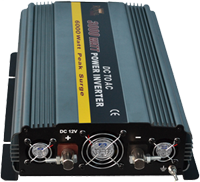 This 3000 Watt 12 Volt DC to AC Power Inverter is specially designed to perform under extreme conditions. With its reinforced steel brackets the model is made to absorb the shocks of the road in a mobile application. This unit can provide over 24 amps of power which gives you the ability to power a large variety of electronics. From all types of battery chargers, TV’s, Power Tool (Power Drills, Saws, Pumps, Vacuums), microwaves, air conditioners, water pumps and air compressors.